Fort Denison is the unmistakable little island with an old style fort. It is located in the main shipping channel of Sydney Harbour. Unlike other islands in the harbour, Fort Denison was designed for military uses in the 19th century. It was originally used as a prison for convicts who re-offended in colonial times. The fort structure you see today, known as the Martello Tower, was built as a military facility in by the British government. It was completed in 1857 and built with local Sydney sandstone. These days the island is an automated navigation facility. Onshore facilities include a museum, a modern restaurant, and authentic local sandstone and outdoor recreation areas. 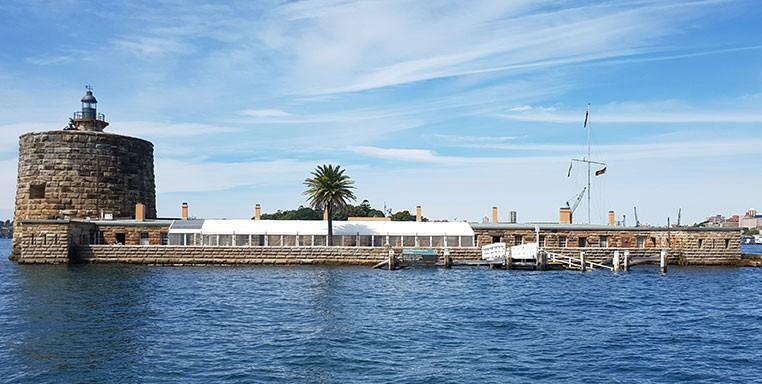 Fort Denison is a very popular picnic and tour destination, with stunning harbour views across the harbour and foreshore. Let Majestic Water Taxis take you to visit Fort Denison. Ride along in one of our luxury private water taxis, perfect for business and family groups alike. Contact Majestic Water Taxis 0439 625 377 or email us on . Note seperate landing or tour fees may apply when visiting any of the Sydney Harbour Islands, visit Sydney Harbour National Park for more information.